Prof Robert Reid is descendant from a famous Glenbuchat family. The Reid family of Baltimore. Professor Robert Reid MD, LLD, FRCS was born in 1851 the 3rd son of the Rev'd William Reid and his wife Elizabeth Scott. He succeeded Sir John Struthers to the Regius Chair of Anatomy at Aberdeen University in 1889. 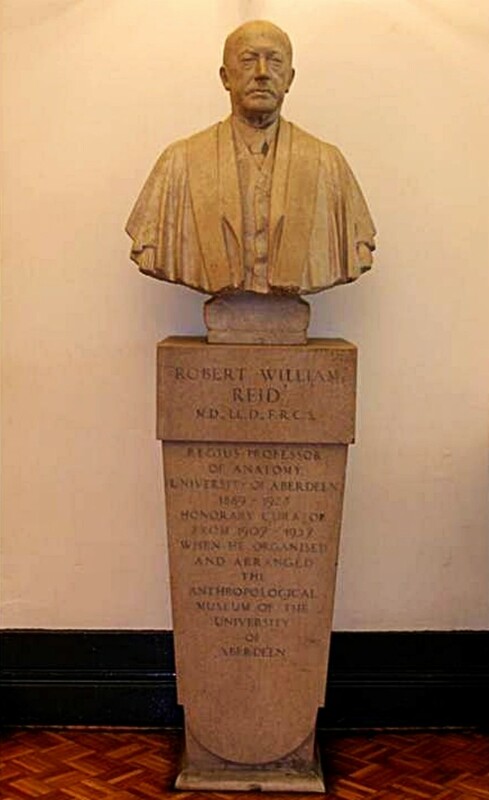 During his career he achieved prominence through the discovery of 'Reid's Base Line', and during his time in Aberdeen he made significant contributions to the development of Anatomy and Anthropology in the university and locally. He established an anthropometrical laboratory in the Anatomy Department in 1896, which formed the foundations of the Department's significant work on the growth of children. In 1907, he succeeded in bringing together the disparate collections of anatomical, archaeological and anthropological material that then existed within the university to form the University Of Aberdeen Anthropological Museum for which he remained its Honorary Curator until his death in 1937. Copy from a series of sketches of Aberdeen medical teachers of the recent past. The first, contributed by Dr. Alexander Lyall, deals with "Bobby" Reid. PROFESSOR R. W. REID, M.D., F.R.C.S., LL.D. Professor Robert William Reid was one of those stalwarts who held Chairs in the Faculty of Medicine during the 14 -18; War and continued to teach greatly increased numbers of students in the first post war years. Among his colleagues were John Marnoch, Ashley Mackintosh, McKerron, McWilliam, James Trail, Matthew Hay, Soddy, Cash and Marshall. Among the students were officers, N.C.O's. and men from any, or all, of the service units; those who had held exalted rank like R.R. Trail and George Christie, and men like MacCulloch straight from the Flying Corps, who later was the author of ‘Viri Illustres Aberdonienses’. Others who were well-known were V.B. Milne, A.G. Badenoch, Forbes Catto, John Clarke, and Jack Wilson, the twins Alan and Richard Downie, who had come up from school and graduated with first-class honours. They came under the spell of Bobby Reid quite early _since Anatomy was begun in the first year. He had a great reputation as distinguished graduate, as teacher, and as disciplinarian. He was a son of the Manse, his father, Rev.' W. Reid,-being incumbent of the Parish of Auchindoir on Donside. There, the sixth of a family of nine, Bobby first saw the light in 1851, about the time of the Crimean war. A curious find, at Ord, in the Parish of Auchindoir, in 1856, was one of the earliest examples of the stone cist burials of the prehistoric inhabitants of the North-East of Scotland. This may have had some influence in the later career of Robert Reid and, as a further curious coincidence, as detailed by Sir Arthur Keith, the physical skeletal measurements of Professor Reid, in adult life, were characteristic of those early inhabitants, even to stature, length of femur and humerus, and brachycephalic index. Amongst his ancestors on his mother's side, a grand-uncle was the Rev. Dr. Alexander John Forsyth of Belhelvie, who invented the percussion lock in 1805, and patented it in 1807. With an educational grounding at Lumsden, and a short stay at the Grammar School, and sessions at King's College in ‘artes liberales’, he was prepared to start a medical course at the age of 17 and came under the influence of Sir John Struthers who initiated his interest in Anatomy and, after his house appointment, introduced him as demonstrator of Anatomy in St. Thomas's Hospital in 1873. As students under Professor Reid we were led to believe that his aim eventually was surgery, but that the unfortunate incident of a severe infection involving the flexors of his right index finger and leaving it stiff, precluded his surgical aspirations, and he remained dedicated to Anatomy. This index finger is famous whenever Aberdeen graduates meet, as Bobby had a habit in conversation or deliberation, or even in demonstrating the attach- ments of a muscle, of rubbing his nostrils with this stiff finger. Imitation of this gesture characterises Bobby to all his erstwhile students. As Sir Arthur Keith says "modesty, honesty, learning, and real efficiency quickly came by their own in the person of Robert Reid, who identified himself with the interests of the school (St. Thomas’s Hospital) and came to feel himself part of it." In this respect it is interesting to note that this association with St. Thomas's has continued throughout the years. Hugh Maclean became Professor of Medicine there after the first war and did his important work on trench nephritis, and other types of renal lesions and initiated much of the early work in the use of insulin and the care of the diabetic. From Professor Reid the present writer had an introduction to the same medical school and, at present, the tradition continues in the occupancy of the Chair in Medicine there by Professor William J. Cranston. Professor Reid remained in London until 1889 when he was Reader in Anatomy, Vice-Dean of the Medical School, and a founder member of the Anatomical Society. Upon the resignation of Professor Struthers in 1889, Robert Reid became the Regius Professor of Anatomy in the University of Aberdeen. The stipend of the Chair, with good endowments, was then said to be the best in Aberdeen at £1,760, but it should be remembered that the pound was probably worth about ten times its present purchasing power, and wages were low, skilled tradesmen working about a 50-hour week: for under thirty shillings, and housemaids paid with six pounds in the half-year. During his tenure of the Chair, Professor Reid carried out many changes, ‘suaviter in modo, sed fortiter in re’. He saw to the construction of the fine dissecting theatre as it is to-day. He took over the library when that was removed to the new frontage of Marischal College in 1907, and succeeded in collecting then the beginning of the Anthropological Museum. He persuaded other departments to donate exhibits, and saw the institution of the Wilson Collection and Wilson Travelling Scholarship. Mrs. Hasluck was; one of the scholars, and made valuable collections of interesting material from Albania, including her own handbag which was made from the lower end of a Turkish lady's trousers. The institution of the Farquhar Thomson lectures was the result of his own popular public lectures in Anatomy. He collected and catalogued the series of stone cist prehistoric intestruments, and saw them suitably housed and preserved. He supervised the teaching of many generations of students, and inculcated the view that a sound knowledge of anatomy was essential for all branches of medicine. In his own special work he published his studies on cranial anatomy, and the importance of Reid's Base Line was of great significance in the work of the earlier neurosurgeons, Victor Horsley, Balance, Richman Godlee and MacEwen. Reid’sBase Line stretched from the occipital protuberance, via the external auditory meatus to the lower margin of the orbit. As the title shows, it provided "Observations on the Relation of the Principal Fissures and Convolutions of the Cerebrum, to the Outer Surface of the Scalp." Many stories are told about him as teacher and critic. He was kind to his students, and hospitable. He was critical of some of his colleagues. As Professor Robert Lockhart recounts he characterised one by saying, "The sound of his voice is the breath of his nostrils! " Well coude he singe and pleyen on a rote. He knew the tavernes well in every toun." Having observed some skeletal pathology he ruminated, "Awful chaps these friars, ‘ter Lyall." Not everyone liked him. One lady student, who later spent some time under mental care, pursued him about the tables in the dissecting room with a brandished drawn scalpel. The only other student in the room had to disarm her in her far from amorous pursuit. He had a benign attitude towards students from other lands. One morning, in class, he was obviously intending to take out a coloured gentleman for an anatomical demonstration but, clearly failing on several attempts, with use of the nasal application of the index finger, to remember his name, he said at last “Please come out here, Mr. Brown." Another, born near the slopes of Mount Ararat, had a shilling in his pocket for the landlady's gas if he did not pass. The Professor was rather doubtful of his standard of work in the second professional, both written and oral, but on being informed that he had considerable difficulty with the language, and not being over fond of his company, agreed to pass him. In his later years he began to think of retiring from the Chair, but did not make up his mind until nearly 75. He continued as Honorary Curator of the Anthropological Museum until 1934 when he succeeded in having a lectureship established in Anthropology. With his straggly grey moustache, with his characteristic finger movement, he was a memory to all the students of that era. As Sir Arthur Keith said in conclusion of his biographical sketch he "sought to do a need of justice to a great man and a good friend who always refused to make any claim for himself".